Protocase Designer | The fastest and easiest way to design, price and build custom electronics enclosures. The fastest and easiest way to design, price and build custom electronics enclosures. 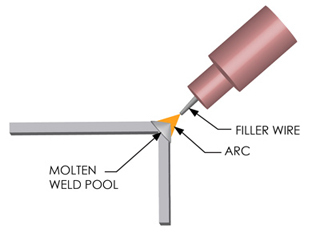 Protocase provides seam welding as a standard process. Seam welding is useful for continuously joining two or more pieces of sheet metal so that they appear seamless. To seam weld, the pieces are clamped securely and welded, and then any excess metal is removed by grinding. The resulting continuously joined seams are useful for weatherproofing, reducing EMI leakage, and for achieving a seamless look and feel when desired. Lower costs, through faster weld times and reduced reject rates. Greater range of materials available for your enclosure designs. Whatever we can fabricate we can now weld. The CMT process physically resembles wire-feed MIG welding in that a weld wire and a shielding gas are fed through a welding torch, and electricity arcs between the weld wire and the welding surface, causing the tip of the weld wire to liquefy and be applied to the welding surface. But CMT uses automatic activation and deactivation of the heating arc to systematically heat and cool the weld wire while bringing the wire into and out of contact with the weld pool many times per second. Because it uses a pulsing action instead of a continuous stream of power, CMT welding generates only one-tenth of the heat that MIG welding does. This reduction in heat is CMT’s greatest benefit and is why it’s called “Cold” metal transfer. During the arcing period, the filler metal is moved towards the weld-pool. When the filler metal dips into the weld-pool, the arc is extinguished. The welding current is lowered. The rearward movement of the wire assists droplet detachment during the short curcuit. The short-circuit current is kept small. The wire motion is reversed and the process begins all over again. Corner seams (see diagram A) are geometrically stable. Stresses from temperature change and solidification are countered by the support offered by both edges of the joint. Most corner geometries can be fully seam welded without warpage using CMT welding. This is true for all metal that we stock. T joints (see diagram B) Seams that join the edge of a part to a flat surface are prone to warping, because there is no geometric support to counter stresses from temperature and solidification of the base metal. Thus, even with CMT welding, if one makes a long seam weld across the part, it is possible that the flat surface will no longer be flat after welding. This is especially true with stainless steel and aluminum. One solution that can work in certain situations is to join by welding a number of short segments, rather than making a continuous seam. This can leave sufficient unmodified base metal to give the part enough integrity to retain flatness. If you require a T-weld geometry, our technical staff can help you with the design. Other weld geometries need to be addressed on a case-by-case basis Contact our technical staff. Protocase Designer® is a product of Protocase Incorporated. © Copyright Protocase Incorporated All rights reserved.